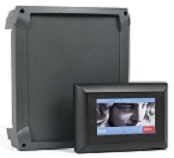 GalleryMonitorTM is designed for smaller museums, stately, historic and luxury homes where it is impractical to have a security control room but object protection is needed for to conserve and protect exhibits on public display. It utilises a variety of sensor technologies (rfid alarm, anti touch, temperature and humidity) and allows upto 60 wire free sensors & 7 hard wired. The radio range can be extended by another 50m or so using a Repeater unit. Sensors should be chosen to utilise the technology appropriate for protecting that item e.g. painting, vase, sculpture, display case or fabric from the recognised threat (theft, humidity, u.v. etc). The GalleryMonitor Control Box can be pre-set to give each sensor a name and group them into 7 or 8 zones. Output relays correspond to each zone which can link to sounders, pagers or CCTV cameras. In addition GSM & SMS communication is available using the modem or commonly a pager system can be linked via the serial interface. If a sensor alarms because someone has touched the painting say, the system can page a particular person, phone a particular number or send an SMS message. GalleryMonitor once set up works as programmed without the need for any computer. This programme can be changed from time to time either by using the basic input keys and short code, or docking a PC upto the serial port and using the simple Set Up software or it can be re-programmed remotely (from distance) if it has been equipped with a GSM modem and SIM card. NEW: Combined environmental (temperature and humidity) sensors available. NEW 2: Detachable display screen to improve security after exhibition set-up. Plus on/off radio remote contol and still camera. Object protection in a stately home, castle, cathedral or small museum communicating to site staff. Environmental monitoring of dampness, humity and temperature. Remote monitoring of CCTV and GalleryMonitor system, triggering camera presets - on site staff alerted..
Link to control room if only small part of museum needs object protection. Management of "Satellite" Museums by Security Officer of the hub museum. Staff protection in a lightly manned location. Protection of art on board a luxury yacht. Connection to an intruder alarm for painting protection in a high net worth individual's home (or a hotel). The most popular detector is triggered either by vibration (magnet option possible). It measures just 79x 39x 9 mm and is battery driven (lifetime upto five years). It is easy to install; it can be placed behind the frame of a painting, in or under a vase, in a display case or somewhere it would be hidden from sight. If the exhibit is touched or moved, the detector will send a wireless signal to the GalleryMonitor control unit (sensitivity adjustable). The system is extremely flexible. Once the Control Box is installed, the sensors can be moved around as one wishes. Detachable screen: Configure and test on set up, remove screen and then turn on and off using the remote control. For more details on the wide range of sensors available with GalleryMonitor Click here Pictures: From top left to bottom right: seismic/vibration sensor, ultrasound, temperature/humidity, GalleryMonitor plus screen, camera and remote control. The system is self contained and once set up from an ordinary PC (either using the serial port or remotely using SMS messages through a mobile phone or GSM calls with DTMF tones) plus control of the 8 output relays runs continuously. A simple software interface on a PC offers the possibility for initial setting up of the entire system, including each sensor/detector. Then the PC can be moved away and the system runs on its own. The control box contains its own aerial to receive signals from the detectors. As an option it can also contain a GSM modem and aerial. Price: GalleryMonitor needs to be estimated as each system is individual. Prices start from around GBP2,500 plus shipping and VAT. Control Box: Connect the control box to a 12v power source. Mount the control box by screwing it to the wall. It should be mounted vertically, with a height of minimum 2 m. The higher up it is placed, the longer range to the detectors/sensors. Make sure that the unit is not hidden behind metal or re-enforced concrete, as this reduces dramatically the distance. The control box should be placed equal distance between the furthest sensors. If the receiving conditions are not good enough, then it could be necessary to place a second receiving box in the room. Pager link: If specified on ordering a pager system can be supplied to ensure alarm information is rapidly communicated to invigilation or security staff. SMS module (extension possibilities): The GalleryMonitor system is often supplemented with a GSM modem. When an alarm is received, the alarm can be send via an SMS message (or call and pre-recorded message), for example, to a mobile phone. The GSM unit is installed in the factory if ordered. To insert a SIM card into the modem, locate the tray under the GSM aerial, the SIM card will slot in contacts face down (Only do this with the power off). Switch the power on and check that the GSM modem has connection to the GSM network via the SmartPatrol PC program. UPS (Uninterrupted Power Supply): GalleryMonitor can be connected to an UPS power controller. With an UPS power controller the system will function a number of minutes after a power failure. Back Up battery: A rechargeable back up battery comes as standard. On power loss the battery enables the system to send an SMS or pager message to alert that power is down. If you are concerned with one or two sensors being out of range switch GalleryMonitor onto "sensor supervision" and if they are out of range you will get a message after a period of time. To extend the range add one (or more) GalleryMonitor Repeater units. Chose the sensors appropriate for the job you require. Contact Euronova if you are unsure. Watch out if you plan to use vibration sensors on laminated glass showcases. The transmission of vibrations can be quite limited. The software set-up can be done by Euronova. You just monitor the alarm calls and contract Euronova to make the programming changes.